Marco Melandri and Eugene Laverty split a pair of victories at Portugal’s Portimao circuit while Sylvain Guintoli took advantage of some misfortune to his championship rivals to increase his lead in the 2013 World Superbike Championship standings. 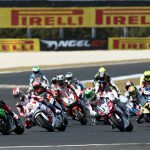 Guintoli has been leading or sharing the lead in the championship since winning the first race of Round 1 in Australia, but amazingly continues to lead despite having just that single victory after six rounds. The Aprilia rider has accomplished this through his consistency (Guintoli leads all racers with nine podium finishes in 12 races) and ability to finish each race (he’s the only rider in the top seven without a DNF). 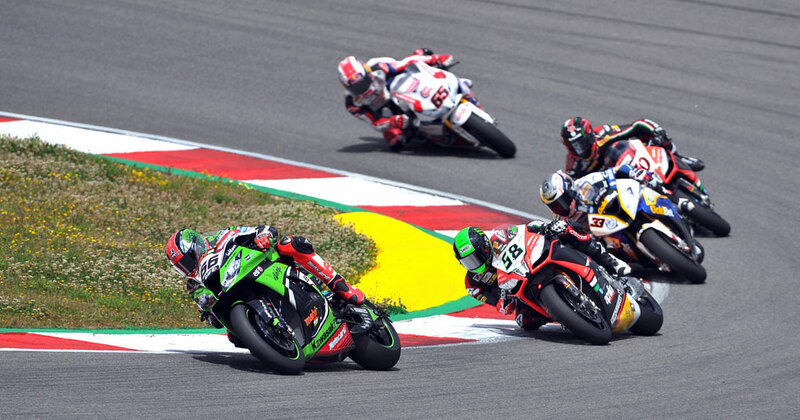 The first race started with pole-sitter Tom Sykes taking the early lead with his Kawasaki ZX-10R with BMW Goldbet’s Melandri and Aprilia’s Laverty dueling for second behind him. Sykes led the first six laps before Laverty powered his Aprilia RSV4 Factory past him. 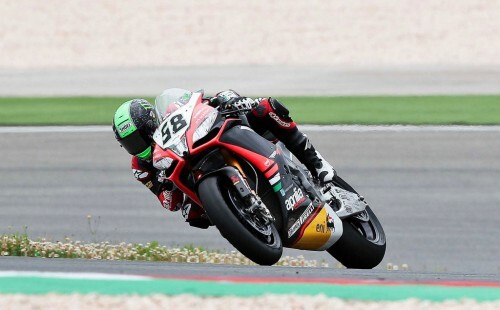 Laverty would lead through Lap 10 before he experienced a technical problem on Lap 11 which forced him to retire with smoke billowing from his Superbike. Melandri then inherited the lead but lost it soon after, dropping to third after being forced wide with Sykes passing inside. Guintoli moved to the front on Lap 19 but quickly passed by Melandri who had regained some of his lost momentum. 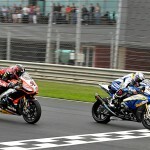 Melandri and Guintoli continued to battle over the final few laps. 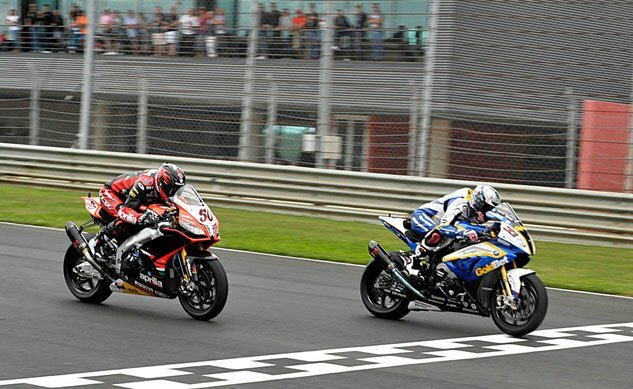 Guintoli tried one final push at the end but Melandri held on to win by 0.007 seconds, the fourth-closest finish in WSBK history. 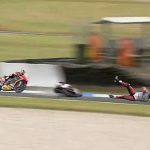 The biggest story in Race Two occurred on the sighting lap when Sykes crashed on the second turn after clipping a kerb on the first corner. The Kawasaki crew scrambled to repair the racebike forcing Sykes to actually start the race from pit lane instead of pole position. Sykes eventually withdrew after 11 laps with a sensor broken from the earlier crash messing up the electronics despite registering the fastest lap of the race. Without Sykes in the front row, it was Laverty taking the early lead followed by Pata Honda‘s Jonathan Rea and Melandri. Eager to make up for his unfortunate Race One, Laverty stayed strong the entire race, developing a lead of more than 4.5 seconds over the field. Rea began to fade over the final laps, allowing Guintoli to move up into second. 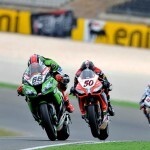 Meanwhile, Melandri experienced some bad tire wear and was forced to nurse the rear rubber to a 12th place finish. 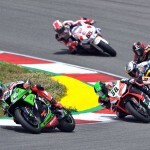 With a pair of podium finishes, Guintoli increases his lead to 28 points over Sykes. Guintoli’s appeal for the results of the Monza round are still being deliberated, and if the the International Disciplinary Court rules in his favor, that lead would increase to 32 points. 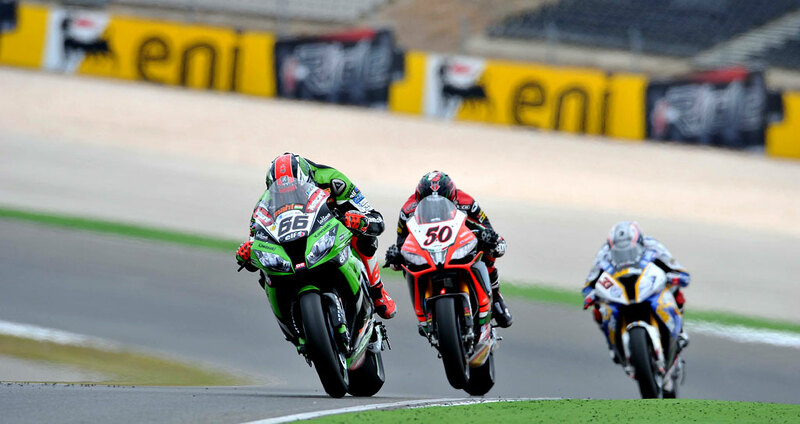 The 2013 WSBK Championship continues June 30 at Italy’s Imola circuit. *Standings still pending an appeal from the International Disciplinary Court.